Eye, head, and body movements are thought to be functionally coupled in the performance of complex skills, such as somersaults with and without twists (Davlin et al. 2001; von Laßberg et al. 2014). Directing the gaze to specific locations in the environment during the takeoff phase in somersaults could influence takeoff kinematics and, as a consequence, the subsequent flight phase. The goal of this study was to investigate the relationship between gaze direction during takeoff and the corresponding movement kinematics when performing backward somersaults in cheerleading. N = 11 cheerleaders performed standing backward somersaults in three experimental conditions (straight gaze direction, elevated gaze direction, depressed gaze direction). 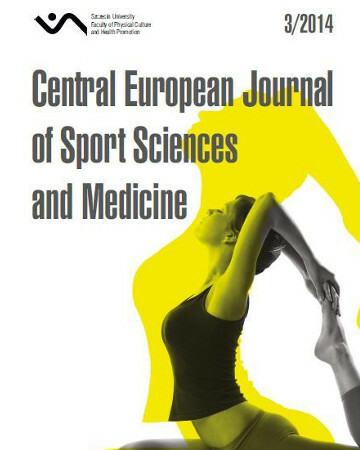 Results revealed that cheerleaders exhibited a larger hip angle during takeoff and longer flight duration of the somersaults when their gaze was elevated during the takeoff phase, thereby supporting the notion that a functional coupling seems to operate between gaze behaviour and motor behaviour in cheerleading. In daily practice, cheerleaders could try to focus their gaze on a point on the wall in front of them during the takeoff phase in somersaults in order to facilitate the development of a functional coupling between gaze behavior and motor behavior. 1. Arkaev L.I., Suchilin N.G. How to create champions. The theory and methodology of training top-class gymnasts. Human Kinetics. Champaign 2004. 2. Davlin C.D., Sands W.A., Shultz B.B. The role of vision in control of orientation in a back tuck somersault. Motor Control. 2001; 5: 337–346. 3. Davlin C.D., Sands W.A., Shultz B.B. Do gymnasts “spot” during a back tuck somersault. Int Sports J. 2004; 8 (2): 72–79. 4. Davids K., Button C., Bennett, S. Dynamics of skill acquisition: a constraints-led approach. Human Kinetics. Champaign 2008. 5. DeMers G.E. Utilizing visual reference points in spring board diving. Swimming World and Junior Swimmer. 1983; 24: 38–39, 41. 6. Enoka R.M. Neuromechanics of human movement (3rd ed.). Human Kinetics. Champaign 2002. 7. George G.S. Championship gymnastics. Biomechanical techniques for shaping winners. Designs for Wellness Press. Carlsbad 2010. 8. Heinen T., Jeraj D., Vinken P.M., Velentzas, K. Land where you look? – Functional relationships between gaze and movement behaviour in a backward salto. Biol Sport. 2012; 29: 177–183. 9. Simi Reality Motion Systems. Simi Motion version 8.5. Germany 2012. 10. Land M.F. The coordination of rotations of the eyes, head and trunk in saccadic turns produced in natural situations. Exp Brain Res. 2004; 159: 151–160. 12. Mann D.T.Y., Williams A.M., Ward P., Janelle C.M. Perceptual-cognitive expertise in sport: a meta-analysis. J Sport Exercise Psy. 2007; 29: 457–478. 13. O’Regan J.K., Noë A. A sensorimotor account of vision and visual consciousness. Behav Brain Sci. 2001; 24: 939–1031. 15. Vickers J.N. Perception, cognition, and decision training: the quiet eye in action. Human Kinetics, Champaign 2007.